For my last review of 2016, I chose a book that I feel is very appropriate for the season. For me personally, this year was an uphill climb. Sometimes, in fact, I felt like I was climbing Mt. Everest in low visibility and hoping for the best. It is easy when faced with tough times to grumble about the bad things, take the good things for granted, and forget to say thank you. The Thank You Book, by Mo Willems is all about saying thank you—to everyone, for everything. Piggie feels that he has a lot to be thankful for and announces to Elephant his plan to say thank you to everyone in his life. Absolutely EVERYONE. Elephant is skeptical. He doesn’t think Piggie can do it. He is sure Piggie will forget someone. Undaunted, Piggie proceeds to thank the squirrels, and snake, and pigeon, and…well, everyone. His good friend Elephant, however, is there to remind him that he did forget someone, someone very important. You will have to read the book to find out who and when you do, you will be pleasantly surprised. I love the joy in this book. Piggie is able to recognize the good things in his life which pushes him to demonstrate overflowing generosity. His enthusiasm is infectious. His gestures are emphatic. He is passionate about showing his gratitude. His conversation with Elephant is funny communicates a familiarity and affection that is usually shared by two good friends. 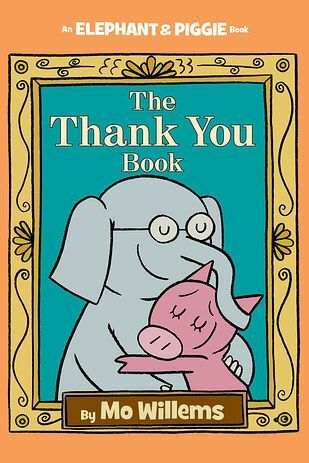 Let’s let Mo Willems and The Thank You Book remind us to say thank you for all of the positive events and people that graced our lives in 2016.